Disk-Image . . $38 repair or replace your RHW hard drive today. to replace your RHW system. Mehmet in Istanbul Turkey said "I installed the new hard drive today. It works great and I have more HDD space. Thanks for your help." Check the model letters (RHW, REW etc) by the AUX jack on the front of your radio. Every system is different. Click your model on the menu-bar above. ALERT-1 If NONE of you hard drive features work, CHECK YOUR SYSTEM before ordering a MyGig Hard Drive. 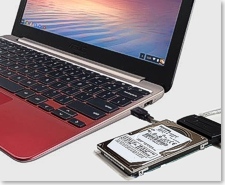 Apply the Disk-Image to a 2.5" 40GB IDE hard drive. Compatibility: The RHW 40GB Disk-Image is compatible with any RHP model year. These Disk-Images will fit on your existing 40GB drive or a 40GB IDE Toshiba, Samsung, Hitachi hard drive. Download 40GB MyGig RHW Disk-Image. No Refunds, but you can apply the $38 to buy a RHW HDD on this page. DOWNLOAD all 10 .rar files to your PC's "Downloads" folder. 50GB of disk space is required for the 40GB disk-image after you unzip the 10 .rar download files. Download files part02.rar >>> part10.rar from this page. If you pay with a Credit Card, a page will pop up with a RETURN TO MERCHANT link. Click RETURN TO MERCHANT for RHW-Part01.rar, and the Imaging Software. A USB-IDE adaptor is available on European Amazon and ebay web sites. This is an example of an inexpensive adaptor on Amazon UK USB-IDE Adaptor. If your MyGig hard drive has failed or the data is corrupt, a pre-loaded MyGig RHW replacement hard drive is the easiest repair available. A replacement hard drive will not fix every possible problem. Please compare your system to the information and "Alerts" on this page. Dash Pry-Tool to assist with removing your dashboard trim. ITEM BELOW: Hard Drive for Cold Climates ( -30℃ ). Rated down to - 30℃. ALERT-2 If your system is rebooting or freezing or crashing, TEST YOUR SYSTEM before ordering a MyGig Hard Drive. Check your system against the 15 point list below. Navigation, Music and Uconnect depend on 3 separate partitions on the hard drive. If you have problems with multiple features, such as Navigation and Music, you probably have a failing hard drive. Also see Customer Stories for their descriptions of problems they fixed with MyGig Disk Recovery options. Stuck on "Navigation is being Activated"
If your system is rebooting, crashing, freezing or won't start-up, check this System-Test before ordering a MyGig Hard Drive. you can return the drive and tools within 30 days for a refund minus a $38 USD return fee. The MyGig Disk-Image has no defects. Sales are final. One Exception: If you order a MyGig Hard Drive after trying a Disk-Image, we will issue $38.00 credit for the Disk-Image. 90 day Exchange for a defective Automotive Duty hard drive. Hitachi and Toshiba original equipment hard drives are used for the RHW system. Your MyGig system cannot be damaged by repairing your hard drive configuration with a Disk-Image or a replacement MyGig hard drive. Nothing on the hard drive is written to your system's firmware. Occasionally MyGig Software Updates and Gracenote Updates create issues with the system firmware. As a no-charge courtesy, MYGIG-DISK.COM provides Downloads and CD/DVD Software updates released by FCA US LLC. We are not responsible for problems that may arise from the installation or the failed installation of MyGig Software updates.